We hired a 3D Printing Teacher! Michael is going to be teaching classes across the country how to 3D print. He's also going to be traveling with us and helping with tech support, but his main focus will be partnering with teachers to create curriculum for their 3D printers! 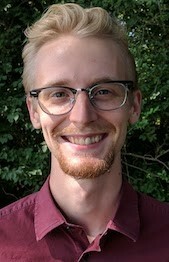 Michael Allen grew up in Mansfield, AR and graduated from the University of Arkansas in 2016 with a Bachelor’s of Science in Career and Technical Education. Michael instructed 7-12th grade classes on 3D Modeling within Fayetteville Public Schools as a certified teacher, has over 4 years worth of 3D modeling experience, and 3 years of customer service and managerial experience. Apart from his interest of utilizing technology in the classroom, Michael enjoys recreational gaming, exploring bleeding-edge technologies, and nature photography. If you need help integrating your 3D printer into your curriculum, contact him at mallen@nwa3d.com.